Heimdall return with a vengeance. The Italian combo, certainly one of the best Italian metal bands, is back with this new album, “Hard as Iron”. Heimdall started their musical career back in 1994 thanks to the efforts of Fabio Calluori (guitar) and his brother Nicola (drums). 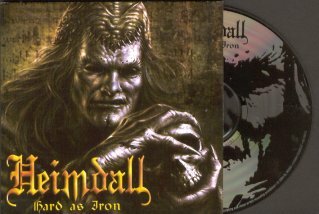 After three albums and a lot of deserved success, especially in Italy and Japan, and some changes in the line up, Heimdall composed this “Hard as Iron”, maybe their heaviest album. Surely a reason of pride for the Southern Italy metal scene, that is so often underestimated, confirming a band of epic metal that surely left its mark in the epic landscape. “Hard as Iron” opens with the track that gives the name to the album. It is an intensely heavy and epic track, in which the expressive voice of Giacomo Mercaldo appears already at its best, surfing on a tidal wave of notes by the excellent guitar and rhythms. The keyboards of Sergio Duccili add a rhythmic pattern of synth that makes the song interesting and at the same time allows the flow of the main theme, up to the bridge in which the voice becomes almost lyrical and the arpeggios of keyboards create a carpet for the performance of Giacomo that introduces the excellent technical solo by Fabio Calluori on guitars. “Midnight” is a dark episode in the album, again with the arpeggios of synths that accompany the voice and introduce an ominous rhythm of Enrico Canu (drums), as the song develops in perfect epic style with heroic choirs as the song rises in power and dramaticity, surrounding the listener in the anguish of the darkest hour of night. Very good the guitar work again by Fabio and Carmelo Claps (guitar), that sometimes almost become a “second keyboard”, performing carpets of sound in the usual realm of the keys. “Moon-Red Light” is another story. Here the song is clearly aggressive and the bass played by Giovanni Canu leads us to a very epic riff of technical arpeggios of keyboards (sometimes Sergio Duccilli reminds me of Tony Banks for his arpeggio solutions). This song is marked by sudden changes of rhythm marked by vocal counterpoints. The power riffs of guitars add to a power-style pattern of drumming that makes this song maybe the most “epic-power” of the album.. Again a very nice piece of guitar technique surely will please the listener. An acoustic guitar arpeggio with a reverse-taped voice introduces the good keyboard work on “Black Tower”, and the guitar solo shows that these Heimdall are meaning. Voice and drums mark this heavy metal song that will likely be appreciated by any Metaller, almost as the other instruments are the minions of some dangerous emperor of rhythms sending them in errands through his reign that is this song. The drumming style here is heavy, commanding respect from the other musicians of the bands that do their best to carry on their mission. The wind and the bass notes of a piano form around a dramatic voice in the moving ballad that is “Cold”, and the lyrics are surely a change of pace from the standard epic songs… Where are you my Angel, I have lost my way… cries the excellent performance of Giacomo. This song gave me contrasting feelings: it is perfectly composed and performed, and exactly for this reason it is also the less original of the album, as it conforms to the standard of heavy metal ballads. Surely a needed change of pace and at the same time a song that will divide the fans. Understanding our feelings the guitars and changes of tempo of “The Emperor” emerge from the next track of the disc (that also marks the beginning of best part of the album itself). Driving keyboards follow the bass and drums, and Giacomo rises upon the sounds with his voice telling us the tales of this dark emperor. A very epic song again, marked by unexpected passages of acoustig guitars that return to powerful rhythms marked by ominous chords of keyboards, and in my humble opinion this song is the second-best of the album. Great openings of doubled guitars and constant carpets of vocal pads as the stream of drums and bass leads on to a bass solo (well done, Giovanni!) on which the voice of Giacomo whispers up to an epic-breathing bridge in which several voices entwine into a suggestive rainbow of sonorities (on which I would have seen a more exotic drumming, to be honest). “Dark Home” is in my opinion the best episode of “Hard as Iron”- I may be influenced by the sounds aptly chosen by Heimdall, and by the driving cadence, but this song is the most original of the album and honestly one of the most original pieces I’ve heard in the power and epic metal in Italy. Every effect and sound patch in this song feels “right”, and the atmosphere is driving and leads us to follow in the “…land without down” sung about by Giacomo. A special note goes to the keyboard work here… I’d like more songs like this! And beyond the infinite desert of darkness of the previous track we find the “Black Heaven”, and we are greeted by the acoustic guitar and voice with delicate strings in the background. The vocals are exquisitely redoubled as the violins counterpoint the piano that adds cadence and doesn’t take away beauty from this ballade a la “Master of the Winds” from the immortal Man O’War. A delicate song that we are surprised to find in this album and that shows how good are these boys at changing of pace. And almost as they want to confirm my words the dark and powerful intro of “Holy Night” abruptly carries us back to the Epic Metal but this time with a nasty tone of twilight inside. Heavy and strong beat of the drums, sharp and marked rhythms of bass and guitars, and the keyboards again in their carpets of sound with an expressive performance of the voice herald the end of this album with an au revoir that is only longing us for more. All in all this album has several points of strength, and one is the production and mixing. Extremely clean and well mixed sounds came out of this album (as of course Heimdall made us used to). The voice deserves compliments as it is not the usual screaming voice of the power metal, but is a careful and expressive vocalist that we find behind the microphone here, more reminiscent of David Defeis (Virgin Steele) than of any other vocalist in the Epic Metal scene. Very good guitar and bass work, heavy drumming and good keyboards. If I must be honest to my ideas, the second part of the album (from The Emperor on) is also the best part, with more varied and strong songs, but this only marks the fact that Heimdall are capable of producing very varied themes – a quality that lacks in other bands. In my opinion, they would need a pinch of aggressivity that sometimes lacks, a little more involvement of the keyboards, and a more varied drumming in a couple of musical episodes that clearly asked for it. Nonetheless this is again a quality album from Heimdall, and surely one that will keep the Epic Metal scene alive and kicking. Well done guys!